The buildings along Place Jacques-Cartier in Old Montreal in Montreal, Quebec, Canada are brightly lit at night allowing people to view their beauty. In this area of Place Jacques-Cartier in Old Montreal, Quebec in Canada, the City Hall or Hotel de Ville and an old historic building are illuminated at night. The glow around Place Jacques-Cartier allows visitors to Old Montreal to do some night time sightseeing or dining. City Hall, Hotel de Ville, and old building seen from along Place Jacques-Cartier at night in Old Montreal, Montreal city, Quebec, Canada. 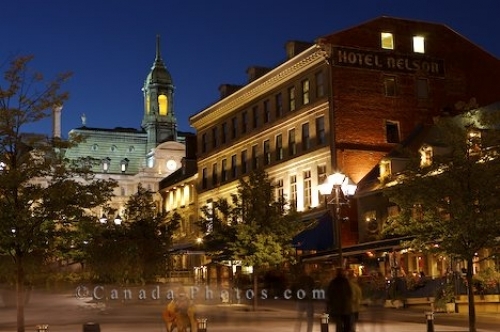 Picture of the buildings along Place Jacques-Cartier in Old Montreal, Quebec during the night time hours.